Ask if that is one of the selections. One spectator will respond positively. Now spread the deck across the table to reveal that his card has also reversed in the deck. Allow the impact of this to register then close the spread. 5. Flick the packet again and carry out another Elmsley Count. The same face-up card will show once again, among the other three face-down cards. Appear slightly disgruntled and repeat the Elmsley Count, with the same result, but outjogging the face-up card this time. Then say, "Perhaps the magic has happened in the deck." Spread the deck disclosing the same card still face up in the middle. You now appear very disgruntled. At this point, appear to notice something wrong with the face-up card. Pull it out from the other two and say, "There's something very peculiar here. I didn't see this staple here before. Did you?" At this, turn the card over to reveal the other selection with both cards stapled back to back, saying to the other spectator, "Is this your card?" This will get some reaction. Pause for a bit before doing anything else, apart from dropping the other two jumbo cards singly onto the table. Finally, reach toward the deck and slowly remove the face-up card from the spread. Wait a beat, then turn it over to reveal the other selection stapled to the back of this card also. Give both stapled sets to the audience for examination. You can use this moment to gather up the deck, separating it at the point where you withdrew the stapled set, then cutting it to bring the two real selections to the top. You can now ditch them at your leisure. You will find that the main interest is focused on the stapled cards and not the deck. A spectator selects any card and signs his name across the face. You imprison this card inside a transparent plastic envelope, and this remains in full view on the table. You now show four identical Jokers, saying that two are Protectors and two are Dispatchers. You give the spectator two Jokers and he keeps his hand flat on top of them. You place the plastic envelope between the other two Jokers. You say, "You might think that these are the Protectors guarding your signed card. In fact, these are the Dispatchers." Instantly the signed card vanishes from the envelope. The spectator lifts his hand to find the signed card between his two Jokers. This is a reworking of Steve Hamilton's "Clearly Vanished" that appeared in Profile. Steve based his routine on Roy Walton's "Jefferson's Jest" from Cardboard Charades. Both of these routines used the Breast Pocket Dodge to dispose of a card. The following is not offered as an improvement on the aforementioned two tricks, it is, however, self contained. Once a card has been chosen, there is nothing to add or dispose of. The plot is Alex Elmsley's "Point of Departure." For this, you require four identical Jokers or four Blank cards. This can be worked with the four Kings from the deck, but you will find that the displacements required to maintain logic throughout are not worth the bother. The effect is much clearer with four identical Jokers. You also need a small, clear plastic, ticket envelope, just big enough to contain a card. There should be half moon cut-outs at the opening (figure 1). You will not need to prepare such a wallet as that is the way they come. These are obtainable at any stationery shop. We will refer to this simply as the envelope in the description. Place three of the Jokers in your pocket along with the plastic envelope. The fourth Joker is on top of the deck. This can be in the deck throughout your performance, and you can bring it to the top when you are ready to perform this routine. 1. Bring out the envelope along with the three Jokers. Place the envelope onto the table to your left. Hold the Jokers face up at your left fingertips and carry out an Elmsley Count showing the three Jokers as four, saying, "Here are four spare Jokers I keep specially for this trick." Place the packet face up onto the table in front of you. 2. Spread the deck and invite a spectator on your left to touch the back of any card. Outjog the card when he touches it. Close the spread and obtain a little finger break below the top card. Remove the outjogged card and turn it face up onto the deck. Lift off the top two cards as one and place them on top of the Jokers on the table. Dispose of the rest of the deck. 3. Pick up the packet and hold it in dealing position. Give the spectator a pen and ask him to sign his name on the face of his card. Ask him to place the pen to one side. As he is doing this, obtain a little finger break below the top three cards. You can do this in two ways. You can Buckle the lower two cards with your left fingers and insert your little finger above them. Alternatively, you can riffle off the lower two cards with your right thumb as you apparently square the packet with your right hand. Flip over the three cards above the break as one onto the packet, then immediately deal the top card onto the table. Place the rest of the packet onto the table to your right. This apparently consists of four face-up Jokers. Pick up the envelope and insert the face-down card, saying, "This will keep your card out of harm's way." Place the envelope onto the table to your left with the cut-out end away from you. Position Check: The envelope lies on the table to your left with the half moon cut-out pointing away from you. This contains a face-down Joker. The audience thinks this is the selection. The Joker packet lies on the table to your right. This consists of three face-up Jokers and the facedown selection located second from the top. The audience presumes these to be four face-up Jokers. 4. Pick up the Jokers from the table and hold them at the right fingertips in position for an Elmsley Count. You will actually carry out a Mario Out-of-Position Elmsley Count. This is often called an OPEC Count, which makes no sense if you think about it! The OPEC is the Elmsley Count with the first card taken from the bottom instead of the top. The rest of the count is identical to the standard Elmsley. This count works well when you are counting a packet of all alike face cards or all identical backs. As you perform the count, say, "These four Jokers have special duties. Two of them are Protectors and two are Dispatchers." hand palm up. Place the right-hand packet on his outstretched palm and ask him to place his other hand flat on top. Do not let go of the cards until his other hand is closing in on the packet. 6. You now hold only one face-up Joker in your left hand. The audience thinks you have two. Flip this card face down and carry out a brief squaring action as if you had two cards (temporary insanity helps in moments like these). Now pick up the envelope and place it on top of the card. Reach below and transfer the card from the bottom to the top, saying, "I will now further secure your card between the Jokers." Take the card and envelope in your right hand, with your thumb on top and fingers below (figure 4). Turn the hand briefly to show the underside of the envelope (figure 5), then turn the hand back again. This brief display shows what appears to be the Joker on the underside of the envelope. The fact that it is inside the envelope is not discernible to the audience. You can carry out a Stanyon Two as Three Count at this point to further highlight the position. This is optional, but I think it is quite effective at this stage. It is a simple move, made even easier with the plastic envelope. The envelope being slightly larger than the cards, and being somewhat slippery, does help. Hold the card and envelope at your right fingertips in position for an Elmsley Count. Count off the top card into your left hand, as you count, "One". 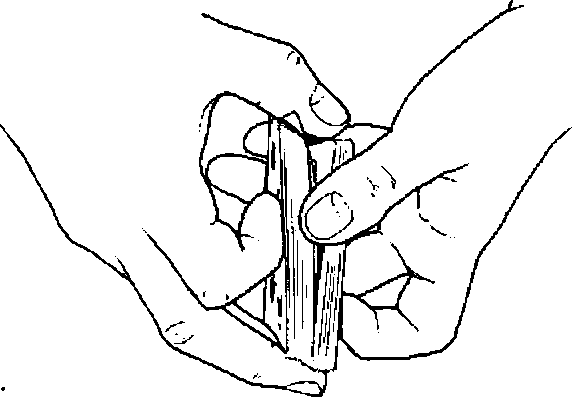 Come back to count the envelope into your left hand, placing the card beneath the envelope (figure 6). Your right fingers grip the card as the left thumb pulls off the envelope (figure 7) and you count, "Two". In other words, the card and the envelope exchange places. Finally, transfer the card from the right hand on top of the envelope as you complete the count, "Three". As you count, say, "Your card should be quite secure, encased in plastic and guarded by two Jokers." "PtS-REf2- DLM=T=X.e widely (figure 9). This sudden disappearance of the selected card is very startling, so hold this pose for a moment as the impact registers with the audience. Now drop the envelope onto the table, turn over the two Jokers, and drop them face up on either side of the envelope. 9. Look at the audience, saying, "I wonder where the card went?" As you finish saying this, direct your gaze to the other spectator who is holding the other Jokers between his hands, and say, "You have been holding the Protectors all along." Ask him to place the packet onto the table and spread the cards. A face-down card shows itself between the two Jokers. Turn this over and give it back to the spectator who signed it to bring the effect to a close. You introduce a regular blue-backed deck of cards. This could be the deck that you have already been using for other routines. You next remove a single (yes, it is only one card) red-backed card from your pocket or wallet. This, you say, is your membership card for the famous Magic Circle in London. You ask a spectator to sign his name on both sides of this card. A second spectator signs his name on the back and front of one of the cards from the deck. Without any moves, the signatures on the faces of both cards transpose. You give both cards to the spectators as souvenirs. The deck is otherwise normal. This is a different approach to the Peter Kane "Signature Transposition" that appeared in Mentzer's Card Cavalcade (1972). In Duffie's Card Compulsions I included two versions, "No Two Ways About It" and "Changing Sides." Here, the addition of an odd-backed card adds a new dimension. Whether it enhances the effect or not, is a matter for the reader to decide. For this description we will use a blue-backed deck. You also need one red-backed card that otherwise matches the deck. Let's say that this card is the Two of Diamonds. Place this card into your wallet. You can be using the deck for other routines prior to this one. When you want to perform this effect, simply make sure that the Two of Diamonds in the deck is not near the top. It is also a good idea to ensure that the top card of the deck is of a contrasting color to the red-backed card. For this description we will make the top card the Ten of Spades.